Stone ground corn flour, coconut and/or soybean oil, water, niacin, iron, thiamine, riboflavin, folic acid, lime. 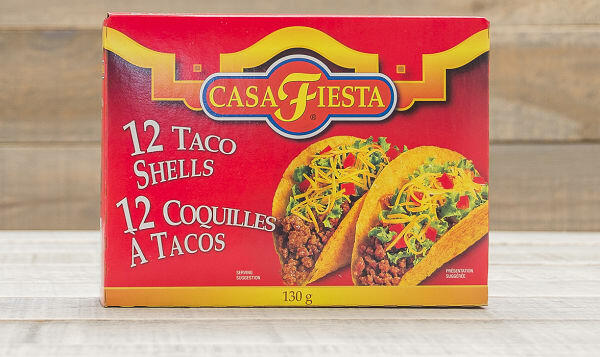 Turn any party into a "Fiesta" with Casa Fiesta. These taco shells are made from only the finest stone ground corn, then baked into a delicious tortilla and finally fried to a golden delicious crunch. This product traveled 2959 km to reach our warehouse. Casa Fiesta offers a full line of authentic Mexican prepared foods and ingredients sold in supermarkets in over 100 countries worldwide. Casa Fiesta is the only major brand of Mexican foods still produced in El Paso and was the early pioneer of the first canned Mexican foods in 1931. Casa Fiesta uses the authentic ingredients and recipes of Old Mexico and Texas border towns. Irrigated with the waters of the Rio Grande, the Mesilla Valley fields of New Mexico that produce the main ingredients used in Casa Fiesta products have the perfect climate, topography, and growing conditions needed to manufacture the finest blend of peppers, spices, herbs, and vegetables that make up the authentic Tex-Mex and Mexican cuisine. And, Casa Fiesta uses only All Natural ingredients.